My lab’s research is focused on investigation of cellular interactions within the tumor bone microenvironment that contribute to tumor progression, with a specific focus on immune cell-tumor interactions. Within bone, metastatic cancer cells highjack the normal couple process of bone remodeling, resulting in excess bone degradation and subsequent release of growth factors that promote tumor growth. Additionally, cancer cells progress and mediate bone turnover through molecular and cellular interactions with the surrounding bone stroma. 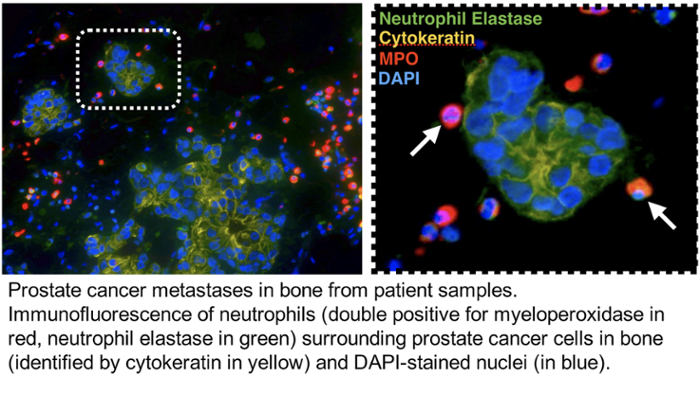 My lab is currently focusing on identifying the importance of neutrophils and/or granulocytic MDSCs in prostate cancer progression and cancer-induced bone disease using a combination of transcriptome and proteomic profiling of patient samples and mouse in vivo models of bone metastasis. My goal is to identify novel immunotherapeutic targets for treating and curing bone metastatic cancers. Dr. Cook's research is also listed under Cancer Metastasis. Dr. Kielian’s research interests span the fields of immunology, infectious diseases, and neuroscience with a unifying theme of innate immunity. 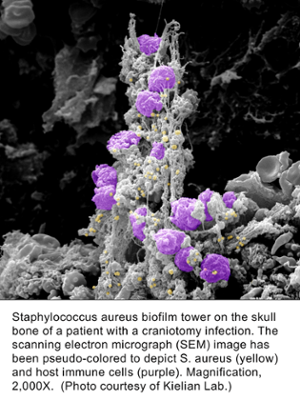 Her laboratory has a long-standing interest in studying the pathogenesis and immune responses elicited by Staphylococcus aureus (S. aureus) both in the periphery and the central nervous system (CNS), with a particular emphasis on microglial and astrocyte activation. Dr. Kielian’s earlier work was focused on understanding neuroinflammatory pathways elicited during S. aureus brain abscess formation, which has transitioned to investigate immune mechanisms pertinent to S. aureus biofilm infections. To this end, her laboratory has developed mouse models of biofilm infection associated with orthopedic implants and cranial bone flaps that accurately mimic the attributes of biofilm infections in humans. Her laboratory was the first to propose that S. aureus biofilms actively elicit an anti-inflammatory immune signature to explain, in part, why these infections persist in an immune competent host. This is achieved by the preferential recruitment of myeloid-derived suppressor cells (MDSCs) in addition to polarizing macrophage infiltrates towards an anti-inflammatory, pro-fibrotic phenotype. Ongoing studies are to identify the mechanisms responsible for skewing the host innate immune response to an anti-inflammatory state following S. aureus biofilm infection and how this may be targeted to facilitate bacterial clearance. Her laboratory is utilizing high-throughput next-generation sequencing approaches (RNA-Seq and Tn-Seq) to elucidate critical molecules that promote biofilm development from both the host and bacterial perspectives. Other projects include 3D bioprinting approaches for the prevention/treatment of biofilm infections and active collaborations with orthopaedic surgeons at UNMC to investigate immune pathways in patients with prosthetic joint infections. More can be read about Dr. Kielian's research listed under Host-pathogen Interactions. Methicillin-resistant S. aureus (MRSA) infection complicated by influenza emerges as a leading cause of death during recent influenza pandemics and epidemics. Defective bacterial control and exaggerated lung inflammation are believed to be responsible for high mortality in patients and animals. 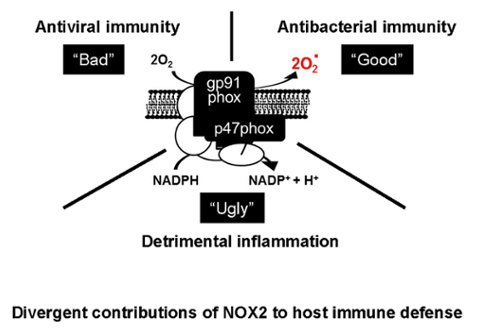 NADPH oxidase 2 (NOX2) is an enzyme complex predominantly expressed by phagocytes. The generation of reactive oxygen species (ROS) through NOX2, a process called oxidative burst, is required for lung S. aureus clearance. Using mouse models of influenza and S. aureus coinfection, our laboratory has established that intracellular ROS in phagocytes decrease after influenza infection, thereby leading to defective killing of S. aureus. However, although intracellular ROS are reduced on a per cell basis, there are excessive inflammatory cells that release oxidants during coinfection. This event eventually culminates in lethal oxidative lung damage. Currently, the focus of our lab is on understanding the molecular basis of this influenza-induced immune dysregulation. The ultimate goal of our study is to establish the treatment strategy to restore antimicrobial defense while limiting inflammatory lung damage during influenza and S. aureus coinfection. Dr. Sun has another facet of her research, which is listed under Host-Pathogen Interactions.